No. 992: What Did They Say in 1490? WHAT DID THEY SAY IN 1490? Click here for audio of Episode 992. Today, we ask, "What did they say in 1490?" The University of Houston's College of Engineering presents this series about the machines that make our civilization run, and the people whose ingenuity created them. Gutenberg finished his Great Bible in 1456, and we all know what happened next. The new medium of print made literacy into a common commodity. It led to modern observational science and a new precision in thought. Print transformed us as few if any other technologies ever have. Yet, in the first 30 years after Gutenberg, people did little more with his idea than to produce classical and religious books in the same style they always had. Not 'til the mid-1480s did printers start including scientific illustrations and offering secular books in local languages to a mass market. A revolution, matched only by the one going on right now, began. After 30 years with microcomputers we see only dimly how vastly they're changing our lives. First, computers kept track of airline tickets and banking. By the early '80s we had word-processors. Now mail is obsolete. Tomorrow, we'll be thinking in ways we cannot imagine. Thirty years after the first minicomputers we face terrifying change. We talk around it, and we can't see where it's going. So maybe it's time to ask, "What were people saying in 1490?" Printers themselves were first to comment. In 1490, title-page information still appeared in a note at the end of a book, called a colophon. Some early printers expanded on that with a more personal note. They often used those notes to talk about how many books they could now make and how accurately they could make them. But that was advertising; it wasn't social commentary. It wasn't a diagnosis of contemporary social change. In our time, thanks to the talent and industry of those from the Rhine, books have emerged in lavish numbers. A book that once would've belonged only to the rich -- nay, to a king -- can now be seen under a modest roof ... There is nothing nowadays that our children ... fail to know. Brant addresses only the availability of books. He doesn't seem to sense that the character of thought is being changed as well. The humanist scholar Erasmus did understand. He used the new print medium to shape his own image as well as to promote his ideas. He knew that print meant much more than increased production. Finally, in 1517, he cried out, "Immortal God, what a world I see dawning. Why can I not be young again?" Maybe it'll take us that long to realize that the computer is no mere tool for speeding communication -- that the stunning changes we're in for are ones we don't see coming. And I find myself saying, too bad I won't live to know what they might be. Eisenstein, E.L., The Printing Press as an Agent of Change , Vol. I and II, Cambridge: Cambridge University Press, 1979. See especially, Part One, Chapter 1, The Unacknowledged Revolution. Pollard, A.W., An Essay on Colophons, with Specimens and Translations , New York: B. Franklin, 1968. Jardine, L., Erasmus, Man of Letters: The Construction of Charisma in Print , Princeton: Princeton University Press, 1993. It is a not-insignificant footnote to this episode that I obtained the source material for it by going to EXLIBRIS for material. EXLIBRIS is an internet bulletin board for Rare-Books people that uses late-20th-century technology to share information about books from the 15th, and other, centuries. Of particular help have been: Gabriel Austin, New York; Pat Bozeman and Jeff Fadell, University of Houston; Donald Farren, Chevy Chase, MD; Stephen Ferguson, Princeton University; Jeffrey H. Kaimowitz, Trinity College; Luis Nadeau, Fredericton, New Brunswick; Barney Rosenthal; Stephen Tabor, Huntington Library; Jack C. Thompson, Thompson Conservation Laboratory in Portland, OR; and John Windle, antiquarian bookseller. 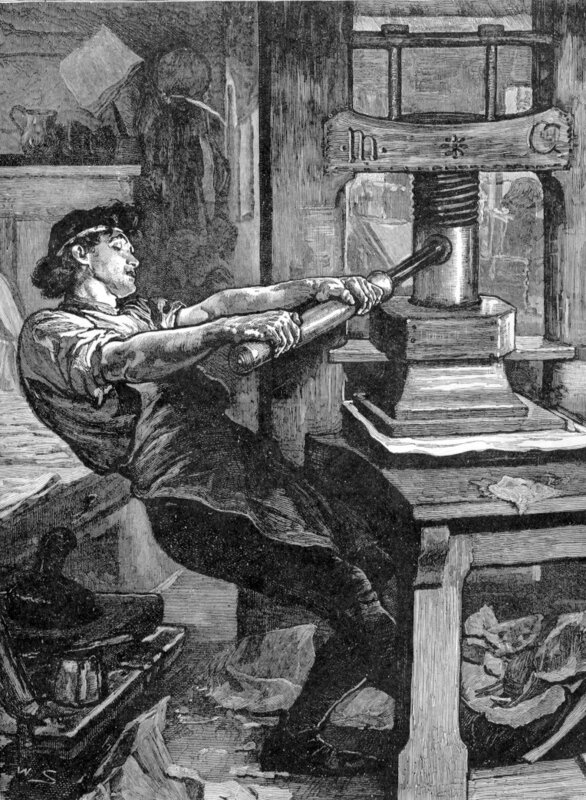 For more on Gutenberg, see Episodes 216, 628, 753, 756, and 894.